How do you embed the audio portion of any YouTube video into your website? An easy option would be that you convert the YouTube video into an MP3 file and upload it to an audio hosting site like Soundcloud. This will work but YouTube is very likely to have a problem with your approach due to copyright issues. Check out this live demo. It may resemble an embedded audio player but there’s actually this YouTube video that’s playing in the background. It takes just one step to embed a YouTube audio. Open any YouTube video and make a note of the YouTube Video ID (a string of 11 characters). There are few other configuration parameters that you can change depending on requirements. For instance, if you set data-autoplay to 1, the audio will begin playing immediately on page load. Likewise, set data-loop to 1 and the audio will play continuously in a never-ending loop until manually stopped. 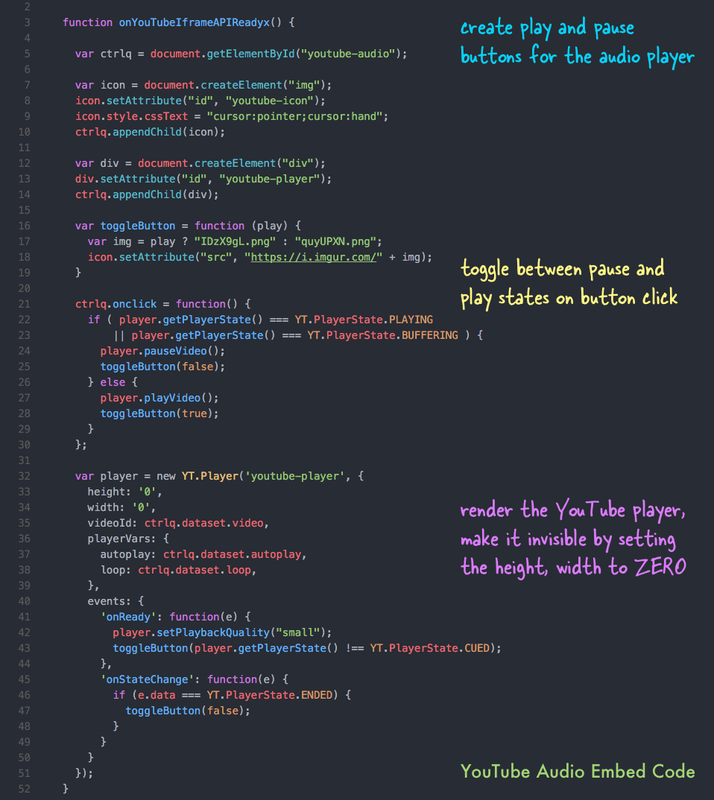 This internally renders the YouTube video using the IFRAME player and would thus work on both desktop and mobile browsers. Here’s the annotated version of the source code. It can be extended to embed YouTube playlists, the default playback volume can be changed or you even embed a part of the video.